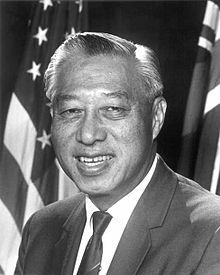 Hiram Leong Fong (Yau Leong Fong; October 15, 1906 – August 18, 2004) was an American politician and businessman. He was the first United States senator for Hawaii. He served as senator from 1959 to 1977. He was a member of the Republican Party. Fong ran for President of the United States in 1964. He lost the primary to Barry M. Goldwater. He was the first Asian-American to run for President of the United States. Patsy Mink would follow him as the few Hawaiians to run for President. Fong died in Kahaluu, Hawaii from complications of a fall, aged 97. ↑ Nakaso, Dan. "Hiram Fong dead at 97" Honolulu Advertiser, 18 August 2004. This page was last changed on 24 February 2019, at 08:47.